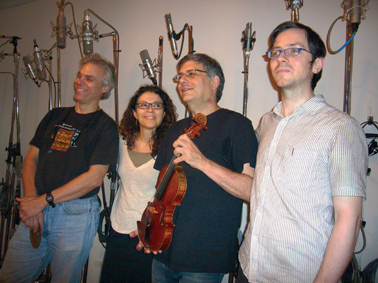 Recorded in New York on July 23rd, 2009 at Sear Sound Studio. Recorded and mixed by James Farber. Assistant engineer: Chris Allen. Mastered at Algo-Rhythms by Michael MacDonald. Cover art: Amy Sillman. Graphic design: Jonas Schoder. 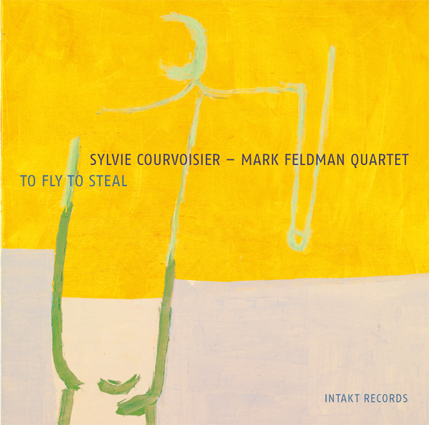 After the sucess of the quintet CD Lonelyville, Sylvie Courvoisier and Mark Feldman recorded To Fly to Steal with the rhythm team of Thomas Morgan on bass and Gerry Hemingway on drums. pulsing improvised music, made through listeningand playing together, and it involves, in the case of four tracks, composed thematic melodic material. Nothing aleatory about it. There are many places where the foursome moves together as a unit, elegantly so, whether at the explosive apex of “Fire, Fist and Bestial Wail,” or in the quietude of the saltwater marsh at sunset on “Whispering Glades.” That kind of commonality feels less like one leading and others following than it does an ensemble responding to a collective calling. 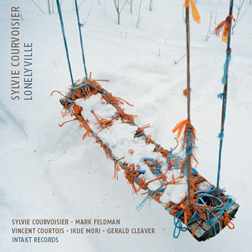 But check the immaculate way that the other three create a space for Mark Feldman to solo, straight out of a jazzier crescendo, at the end of “Coastline,” percussion, bass and piano sketching faintly behind his bold line. Or the way that Thomas Morgan and Gerry Hemingway beautifully improvise between the quicksilver opening statements of Courvoisier and Feldmanon “The Good Life,” setting up the place where they all joyously convene. Good life, indeed. Besetzung auf mit dem jungen Bassisten Thomas Morgan und dem Schlagzeuger Gerry Hemingway. Der Chicagoer Journalist John Corbett schreibt in den Liner Notes: “Es ist organische, lebendige, pulsierende improvisierte Musik, entstanden durch gemeinsames Zuhören und Spielen, und bei vier Stücken beruht sie auf komponiertem thematisch-melodischem Material. Daran ist nichts Zufälliges. Glades». In dieser Form von Gemeinsamkeit hört man weniger ein Führen und Folgen, sondern eher ein kollektives Reagieren als Ensemble. Aber hören Sie selbst, wie unnachahmlich die drei für Mark Feldman einen Raum schaffen, für sein Solo, direkt aus einem Crescendo, am Ende von «Coastline», Schlagzeug, Bass und Piano nur schwach angedeutet hinter seiner schwungvollen Linie. Oder wie wunderschön Thomas Morgan und Gerry Hemingway bei «The Good Life» zwischen den lebhaften Eröffnungsstatements von Courvoisier und Feldman improvisieren, den Punkt aufbauend, an dem sich alle freudig zusammenfinden. Good Life, in der Tat.